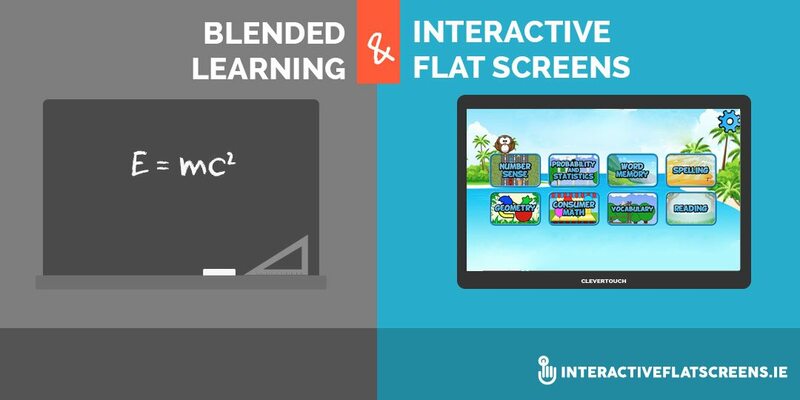 So what is blended learning and where does interactive flat screen technology fit in? In this post we’ll discuss what is blended learning as well as some of the best tools available for blended learning. Blended learning is an approach to education that advocates the use of both traditional teaching methods and information technology based teaching methods. Very broadly speaking, IT based teaching and learning involves 1 to 1 computing. Through the use of laptop computers, iPads and tablets, pupils have a more personalized learning experience. They learn about what they want to learn and they do it at their own pace. 1 to 1 computing has many benefits including better communication between teacher and student, increased creativity as students engage and interact with educational apps and preparation for an IT based work place. Of course, most of us are familiar with traditional teaching but for the sake of clarity let’s briefly define it. Traditional teaching involves a more rigid, one-way system in which pupils, as a body, are passive recipients of knowledge that they ‘need’ to learn as much as ‘want’ to learn. It makes sense that blended learning, as a synthesis of these two models, is the way forward. So where does interactive flat screen technology fit in with this overall picture? The answer is more interesting and complex than you might think. Of course, interactive flat screen technology is the very latest in IT based learning: through access to the internet and a huge number of teaching apps it facilitates a flexible, more personalized approach. But it also facilitates traditional teaching as it is the blackboard (or whiteboard) of the new IT equipped classroom. In traditional learning, the blackboard was one of the most essential tools for transmitting knowledge. It was the focus and object of the learner. ‘Object’ is an important word here as, put very crudely, traditional teaching is more objective than the more subjective, personalized experience of 1 to 1 learning. So the interactive flat screen simply replaces the blackboard and chalk. It is the focus and object of learning in the new classroom. It preserves the pedagogic tradition of transmitting knowledge in a computerized environment. Through it, the teacher asserts his/her authority and the learner focuses on what he/she needs to learn. So, it is fair to say that the interactive flat screen is the ultimate tool for blended learning. It should never be forgotten that a disciplined mind is essential for social mobility and success. However, creativity and imagination are just as important as a person makes their way through life. The beauty of interactive flat screen technology is that it harnesses both abilities. Ours is an age of transition. Sometimes it’s hard to see what the future holds. We need visionaries and this is especially true of education. But we can be certain that blended learning is the way forward if we want to prepare our children for society in the 21st century and interactive flat screen technology, as the ultimate tool for blended learning, is likely to be around for a very long time. 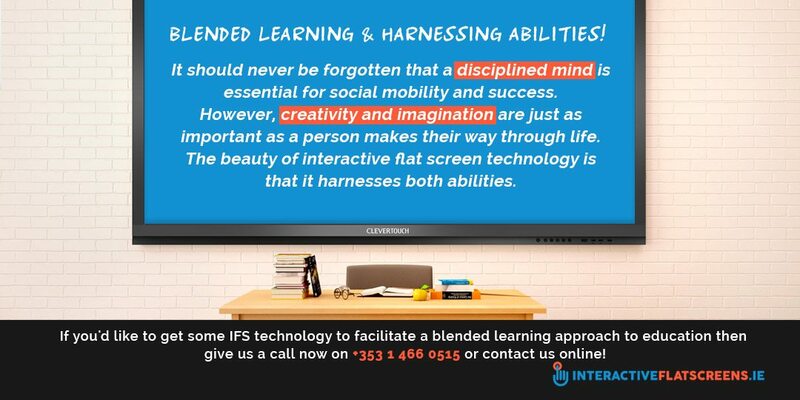 If you’d like to get some IFS Technology to facilitate a blended learning approach to education then give us a call now on +353 1 466 0515 or contact us online!